The FodderTech Controlled Fodder Production Systems are designed using hydroponic technology to provide and control nutrient and water input to growing roots. 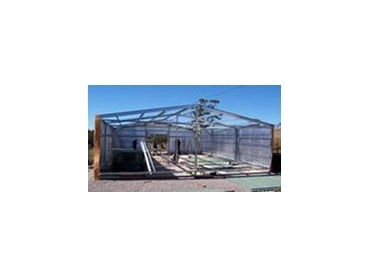 Available from Fodder Technologies , these systems produce fodder in a controlled environment that is housed in a fully insulated, specially designed solid steel shed construction on a concrete slab. Just the basic structure of the Controlled Fodder Production Systems are made to withstand high winds and, depending on the design and requirements, can withstand extremes of weather and climate. The unique bottom automated fed system is the vital difference between FodderTech systems and most other existing hydroponic systems. Constant spraying of fodder within sheds or greenhouses can increase humidity, not only wasting water but also making the growing environment conducive to potentially fatal moulds and fungi. This 'Water Wise' production system is fully recirculating and can convert 1kg of Barley seed into 7-8 kg of fodder in a short seven day cycle.